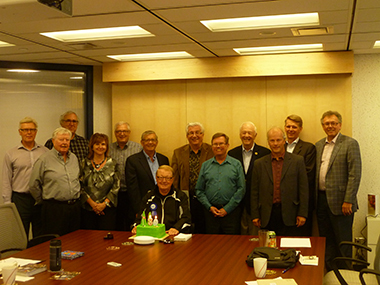 The annual general meeting of 2015 celebrates Norm Fiske’s 80th birthday. Norm, on the left, was the Foundation’s first chairman. 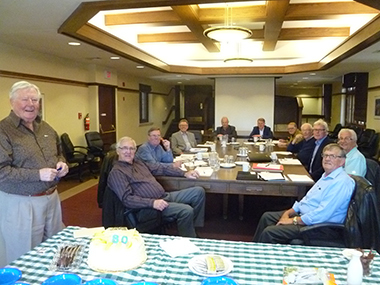 Bob Filuk’s 80th birthday is celebrated at the Foundation’s 2016 annual meeting. Bob was a founding governor. He is joined here with Bev Klym our Administrative Assistant and several members of the foundation. 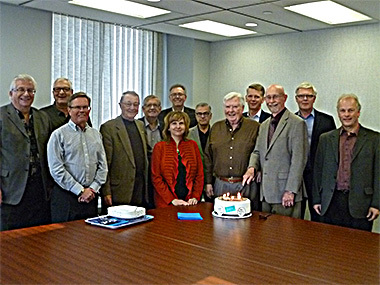 The foundation’s 30th anniversary is celebrated with a cake at the 2017 annual general meeting. Doing the honours is Hugh Arklie, the retiring executive director. The Thomas Sill Foundation was incorporated in the Province of Manitoba on July 31, 1987. Investment Counsel: GWL Investment Management Ltd.